Currently viewing the category: "Acquisition"
Below is my personal quick summary of the Navy FY2016 Budget Highlights Book as it most pertains to those individuals in the Information Dominance Corps. To operate effectively in every mission, we invest in protection of our cyber networks. The Department has expanded previous investments in Operation Rolling Tide (ORT), which was primarily focused on tactical networks such as NGEN and CANES, to include combat and other control systems on tactical platforms. Task Force Cyber Awakening (TFCA) was established to provide a holistic view of cyber security across the Navy enterprise. Based on TFCA’s prioritizations of required capabilities to improve Navy’s cyber posture, the DoN added $300 million across the FYDP across a broad spectrum of programs. Together, ORT and TFCA efforts form the Cyber Resiliency Plan; investments made in this budget will lead to significant improvements in the DoN’s Cyber posture. The Fiscal Year 2016 (FY16) baseline budget submission of $161.0 billion for the Department of the Navy (DoN) is an increase of $1.5 billion (1%) from the FY16 value presented in last year’s budget. In a challenging fiscal environment, the DoN FY16 budget supports the priorities of the President’s Defense Strategic Guidance (DSG), as amplified by the Quadrennial Defense Review (QDR), and the priorities of the Secretary of the Navy, Chief of Naval Operations and Commandant of the Marine Corps. The DoN can meet the mission areas outlined the DSG and QDR, but with risk. The Department prioritized investments to provide a credible, modern and safe strategic deterrent; global forward presence of combat ready forces; preserve the means to defeat one aggressor and simultaneously deny the objectives of a second; focus on critical afloat and ashore readiness and personnel; sustain asymmetrical advantages; and sustain a relevant industrial base. The FY16 request for overseas contingency operations (OCO) continues to fund the incremental costs to sustain ongoing operational commitments, equipment/infrastructure repair, manpower, as well as equipment replacement. The FY16 DoN OCO request is $7.0 billion. 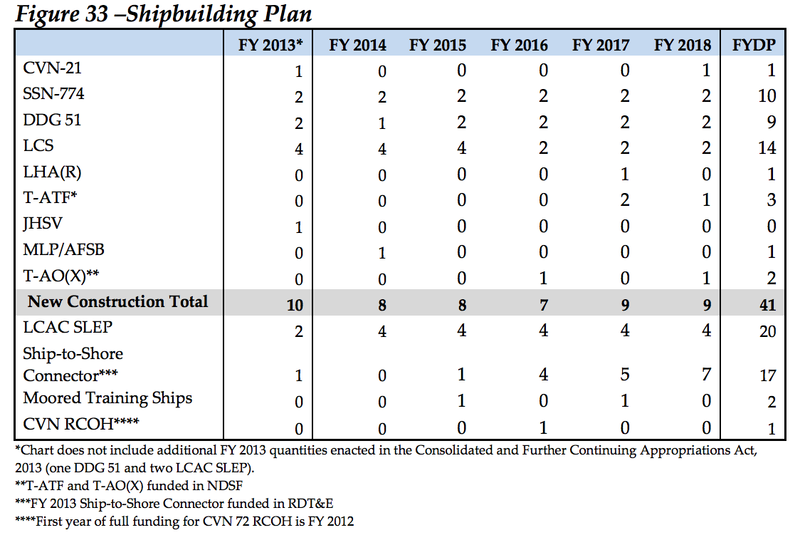 The budget request reflects a deployable battle forces of 282 ships in FY16, including 11 aircraft carriers, 31 amphibious ships, 87 large surface combatants, 22 small surface combatants, 4 guided missile submarines and 53 nuclear powered attack submarines. This battle force number reflects Congressional NDAA language on ship counting rules. Fourteen battle force ships will be delivered in FY16: 1 Nuclear Aircraft Carrier (CVN), 2 Nuclear Attack Submarines (SSN), 5 Littoral Combat Ships (LCS), 2 Joint High Speed Vessels (JHSV), 1 Amphibious Transport Dock (LPD), 2 Destroyers (DDG) and 1 Zumwalt-class Destroyer (DDG 1000). Three Nuclear Attack Submarines (SSN) will be retired. Ship procurement funds 9 new-construction ships in FY16 (2 SSNs, 2 DDG 51, 3 LCS, 1 LPD, and 1 T-AO(X)) and 48 ships across the Future Years Defense Plan (FYDP). Aircraft procurement funds 124 airframes in FY16 and 492 airframes across the FYDP. 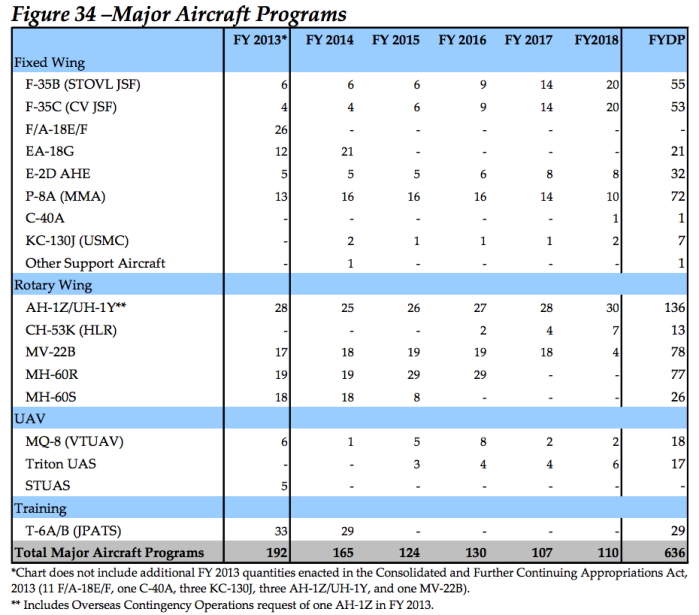 Major aviation procurement in FY16 includes: 13 F-35B/C, 5 E-2D, 16 P-8A, 2 KC-130J, 28 AH-1Z/UH-1Y, 19 MV-22, 29 MH-60R, and 12 UAV. Military basic pay and civilian pay are increased by 1.3 percent. This budget continues implementation of a streamlined reduction to Major Headquarters operating budgets, as well as continued initiatives begun with the FY15 budget to reduce acquisition costs. 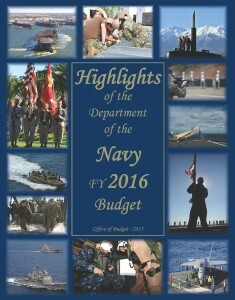 While the Highlights of the Department of the Navy FY 2014 Budget might be a very descriptive title for this fiscal report by the Navy, it is more widely known as the Navy Budget Highlights Book FY14. For those that find themselves wondering how “Big” Navy works the topics of the Fiscal Year (FY) often drive the major decisions of senior leaders. This nearly $1.4M dollar* FY14 Navy Budget Highlights Book serves to layout, in plain english, the labyrinth known as the Navy Budget process. The FY14 Navy Budget Highlights Book lays out the U.S. Navy’s budget process, the strategic thought behind budget allocations, and the mission requirements driving the funding decisions. The Fiscal Year (FY) 2014 President’s Budget (PB) reflects a strategic direction grounded in the reality of the nation’s fiscal challenges. As we transition from today’s conflicts, we must position the Navy-Marine Corps team for the challenges of tomorrow. OPERATE EFFECTIVELY in CYBERSPACE and SPACE – The Navy created Fleet Cyber Command/Tenth Fleet to conduct full spectrum operations in and through cyberspace to ensure Navy and Joint/Coalition Freedom of Action. The Navy must organize, train, and resource a credible workforce of cyber professionals and develop forward-leaning, interoperable, and resilient cyberspace capabilities to successfully counter and defeat a determined adversary in cyberspace. The Navy’s ability to operate and maintain secure and reliable networks is critical to every warfare area and all aspects of daily operations. The Naval forces provide unique physical access to global cyberspace that can be operated remotely in coordination with national capabilities and operations. The Department will continue to work with allies and invest in additional capabilities to defend its networks, operational capability, and resiliency. Education and Training – Today’s Navy is the most modern and technically superior Navy in the world. Our ability to outperform our adversaries on the sea, in the air, below the sea and on land requires a highly educated, trained, skilled, and disciplined force. Emphasis on regaining technical expertise, depth, and business/contracting skills necessary to execute acquisition programs remains a priority within the Department. CYBER growth is commensurate with the demands of National Security priorities. 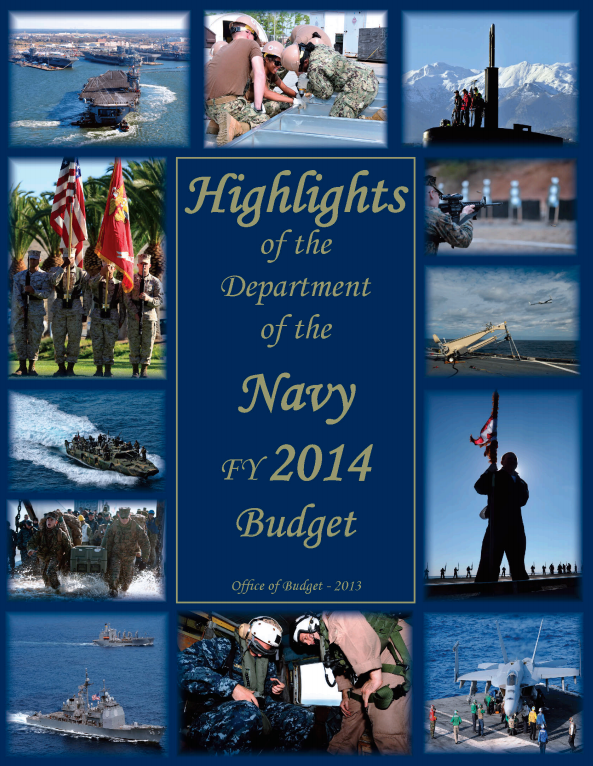 FY14 Navy Budget Highlights Book describes that the Department will maintain strong, agile and capable military forces. Operational readiness is the catalyst that brings naval power to bear whenever it is needed. Our budget supports requirements for our Carrier Strike Groups (CSGs), Amphibious Ready Groups (ARGs), and Marine Expeditionary Forces (MEFs) to execute the National Military Strategy and respond to persistent as well as emerging threats. In FY 2014 six battle force ships will be delivered: one Nuclear Attack Submarine (SSN), one Surface Combatant Destroyer (DDG), one Amphibious Warfare Assault Ship (LHA), two Joint High Speed Vessels (JHSVs), and one Mobile Landing Platform (MLP). Sixteen battle force ships will be retired: seven Frigates (FFGs), three Cruisers (CGs), one Nuclear Attack Submarine (SSN), one Amphibious Warfare Transport Dock (LPD), two Amphibious Dock Landing Ships (LSDs), one Mine Countermeasures Ship (MCM), and one Combat Logistics Ship (T-AOE). Primary Authorized Aircraft (PAA) – Active (FY14 target) – 3,136 total. across FY 2014 to FY 2018. Surface Electronic Warfare Improvement Program (SEWIP)- In response to current threats, the budget requests $132 million for continuing research and development efforts associated with SEWIP, which provides enhance electronic warfare (EW) capabilities to both existing and new ship based combat systems. These capabilities will improve anti-ship missile defense, counter targeting, and counter surveillance activities. SEWIP Block 2 will develop an upgraded antenna, receiver, and combat system interface for the currently installed AN/SLQ-32 EW suite, providing improved detection, accuracy, and mitigation of electronic interference. SEWIP Block 3 will add an electronic attack (EA) capability to the AN/SLQ-32 EW suite, providing an EA transmitter, array, and advanced techniques. These system improvements will ensure the Department keeps pace with the antiship missile threat. The FY 2014 budget continues to support the goal of transforming the force with unmanned vehicles by investing in a broad range of unmanned platforms in support of Joint Force and Combatant Commander demands for increased ISR capability and capacity. These programs support the warfighter by providing a persistent ISR capability through the continued development, acquisition, and fielding of UAV systems such as the MQ-8 Vertical Take Off and Landing Tactical UAV (VTUAV) and MQ-4 Triton UAS. Additionally, the Department is funding future unmanned development, including the technology demonstration of the Navy Unmanned Combat Aerial System (UCAS) X-47B and the Unmanned Carrier Launched Airborne Surveillance and Strike system development. The Standard Missile (SM) program replaces less effective, obsolete inventories with the more capable SM-6 Extended Range Active Missile. The SM-6 high speed/ high altitude missile program started Full Rate Production in FY 2013. The SM-6 and its associated Naval Integrated Fire Control – Counter Air (NIFCA-CA) will provide the capability to employ these missiles at their maximum kinematic range. NIFC-CA exploits capabilities inherent in existing systems, optimizes current and emerging technologies in component system upgrades, integrates them together, and performs kill chain tests, forming an interoperable System of Systems to maximize future air defense capabilities. The Department of Navy has focused on its efforts to integrate the “From The Sea” kill chain consisting of the E-2D Advanced Hawkeye, CEC, AEGIS, and SM-6 missile. Investments in advanced technology such as the SM-6 and its associated NIFC-CA capabilities will enable the Navy to keep pace with the evolving threat and thereby continue to maintain our conventional warfare edge. Advanced Precision Kill Weapons System II (APKWS II) provides a relatively inexpensive, small, lightweight, precision guided weapon that is effective against soft and lightly armored targets and which enhances crew survivability with increased standoff range. APKWS II offers precision, maximum kills per aircraft sortie, minimum potential for collateral damage, and increased effectiveness over legacy unguided rockets. The Department will continue with its third year of full rate production in FY 2014. The Navy’s Command, Control, Communication, Computers, and Intelligence (C4I) programs are the backbone of naval combat capability. In concert with C4I, cyberspace capabilities are critical to achieving DON objectives in every warfighting domain and enterprise business model. The Department of Defense is undergoing a significant transformation in organization, structure, and alignment to enable the full range of operations in cyberspace. The associated cyberspace mission areas of computer network operations and Information Assurance will be enabled by common technologies and must be highly synchronized. DON is reducing information technology (IT) infrastructure cost and cyber vulnerabilities by consolidating Enterprise IT contracts and data centers, as well as improving IT governance. The Next Generation Enterprise Network (NGEN) will improve upon the successes of NMCI. A significant distinction is that NGEN will ultimately be predominately government managed and controlled. NGEN management will be more centralized to support the computing demands of the DON enterprise, and fully aligned with and supported by the respective Navy and Marine Corps network operation commands. NGEN will support net-centric operations and position the DON for transition to the Naval Networking Environment (NNE) vision for FY 2016. NGEN forms the foundation for the NNE, and will be interoperable with, and leverage, other DoD-provided Net-Centric Enterprise Services. The DON awarded the Continuity of Services Contract (CoSC), which began on 1 October 2010, to maintain the existing Navy Marine Corps Intranet (NMCI) network services and provide for the necessary transition support for migration to NGEN. FY 2013 marks the planned transition of the CoSC to the NGEN contract. The FY 2014 budget supports the NGEN program. The Consolidated Afloat Networks and Enterprise Services (CANES) program provides Navy ships and submarines with reliable, high speed local area networks at all classification levels. CANES modernizes existing afloat networks and provides the necessary infrastructure for tactical applications, systems and services required for Navy to dominate the Cyber Warfare domain. FY 2014 investment funds are for the Full Deployment contract award to procure 29 units, two units of technical training equipment (TTE), integration, associated costs for pre-installation design and activity drawings, and installation for 26 afloat units and two TTE units. In addition, funds are for Technical Insertion Software development, Developmental Testing and Follow-On Operational Testing & Evaluation on force level platforms in support of Full Deployment Decision in FY 2014. Navy Multiband Terminal (NMT) is the replacement for existing protected and wideband military SATCOM terminals. The program provides Navy units with the ability to access the next generation of military SATCOM satellites. The system also provides increased capacity, mitigates service denial in a jamming environment and supports execution of the Ballistic Missile Defense mission. The common suite of equipment simplifies logistics support while reducing the footprint of equipment on space constrained ships and submarines. FY 2014 funds will support procurement of 45 units and the installation of 29 units. The advanced Ultra High Frequency (UHF) Mobile User Objective System (MUOS) development and procurement funding continues in the FY 2014 budget, supporting full operational capability in FY 2017. MUOS will provide the DoD’s UHF satellite communication capability for the 21st century. Do you understand the different “colors” of Department of Defense funds? *Preparation of this study/report cost the Department of Defense a total of approximately $1,399,000 for the 2013 Fiscal Year. This includes $71,000 in expenses and $1,328,000 in DoD labor. This means that $71K was expended separately to create this report in conjunction with the financial data created from more than $1.3M in labor costs.